Signed and dated, ll: " W. T. Trego 1887"
Labels on the frame reference T. A. Wilmurt & Son, NYC, and J. H. Lewis & Son, NYC. As in the work, Battery—Halt!, for which it could be a companion piece, the subject is a battery of horse-drawn artillery in action. Evidence that the battery is being brought up in the midst of battle is provided by the fact that the “driver” on one of the lead horses has been shot and has lost control of his animals, a situation that could bring chaos to any attempt to bring the battery into position. The cannoneer closest to him reaches out to grab the reins of the clearly startled horse to bring it under control. Trego considered this man grabbing the reins to be the key to this painting. The figure has been carefully placed in the exact center of a rebated square—a theoretical square measured in from the right edge of the painting a distance equal to the height of the canvas. Our eyes are also drawn to this figure by virtue of the fact that his horse is charging directly at us, its eyes bulging in excitement and foam dripping from its muzzle. A collision of the horses seems imminent and it is unclear whether the effort to gain control will succeed. The charging horse is beautifully foreshortened, as is the body of the soldier on the ground to the far left. The wheels will only barely miss running over his leg. Here, as in other works, the real sense of the noise and terror of battle is provided by the expression of the horses, which are clearly excited, even terrified, by the battle around them. Purchased from the artist by Thomas B. Clarke, in 1887. (H. Barbara Weinberg, Thomas B. Clarke: Foremost Patron of American Art from 1872 to 1899, American Art Journal, Vol. 8, No. 1 (May, 1976), pp. 52-83. ); Sold in 1899 as "Battery Forward! "with a catalog description that makes it clear that it is the same painting called "Bringing Up the Battery", exhibited in 1891 (see below). The date is incorrectly given as 1885. (Catalog of the Art Collection of Thomas B. Clarke, New York, to be sold at absolute public sale, 1899, #325.) Purchased from Clarke in 1899 for $425 by Franklin Rockefeller of Ohio (Florence N. Levy, ed., American Art Annual, New York, 1899, p. 63); There is a gap in the chain of owners until it reaches the collection of Louis Halloway of Middletown, CT, by 1979; From Halloway it passed through Stonington Fine Arts of Stonington, CT, and Butler Fine Art of New Canaan, CT. It was purchased by the James A. Michener Art Museum from Butler Fine Art in 1994. 1. It was shown as "Bringing Up the Battery" at the inaugural exhibit of the Art Institute of Chicago in November, 1887. 2. Clarke subsequently displayed the painting, as "Bringing Up the Battery," at the Pennsylvania Academy of the Fine Arts in Philadelphia in 1891. 3. In 1894 Clarke exhibited the painting, now referred to as "Battery, Forward," at the Art House annex, 366 Fifth Avenue, in New York City. As "Artillery to the Front", it appeared on the cover of Civil War Times Illustrated, Vol. XVIII, no. 3, (June, 1979), courtesy of Louis Halloway. Catalogue of the Loan Collection of Paintings Exhibited by the Art Institute of Chicago at the Opening of the New Art Museum, November 19, 1887, p. 13. Catalog of the Thomas B. Clarke Collection of American Pictures, Philadelphia, 1891, p. 106. This listing erroneously gives the date as 1885. Catalog of the Art Collection of Thomas B. Clarke, New York, to be sold at absolute public sale, New York, 1899. This listing repeats the copy used in 1891, including the erroneous date of 1885. At the time of its exhibition in New York in 1894, a critic commented that “the men and horses are faithful if unbeautiful portraits of Pennsylvania artillery.” ("Art for Hot Weather", New York Times, 1 July 1894. p. 21). The two Thomas B. Clarke catalogs cited above give the following description of the work: “The Battery is advancing to the front under heavy fire from the enemy. One soldier, shot in his saddle, reels under the stroke, while a comrade seizes the bridle his hands can no longer control, in order to guide his charger. 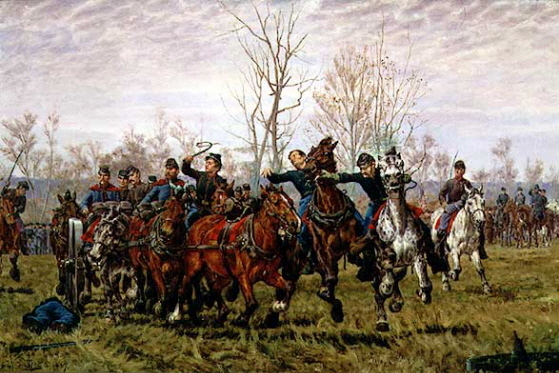 The hurry, dust, and heat of battle are rendered with a spirited brush.” As the description matches the content of the Michener painting exactly, it is clear that the two titles used by Clarke—“Bringing up the Battery” and “Battery, Forward”—refer to the same painting, and the title under which it was published in 1979—”Artillery to the Front”—was a variant title derived from the earlier titles. The painting was conserved upon its arrival at the Michener Museum and is in excellent condition.